I seem to have gained quite the reputation as the go-to person for opinions on magazines (and possibly shooting myself in the foot in the process!). Yesterday, Albertine from Dippy Writes tweeted me to ask what I thought about this Glamour Magazine headline. Now, I like Glamour a lot. It's my favourite of all the women's monthlys so I'm certainly not going to rip it to shreds the way I would... ooh, I don't know... Company, say. However, this headline just looked too good and, after stopping off in the station cafe to buy my copy, I launched right into it on the train. It was amazing! Amazing in an Is-this-writer-for-real? way. 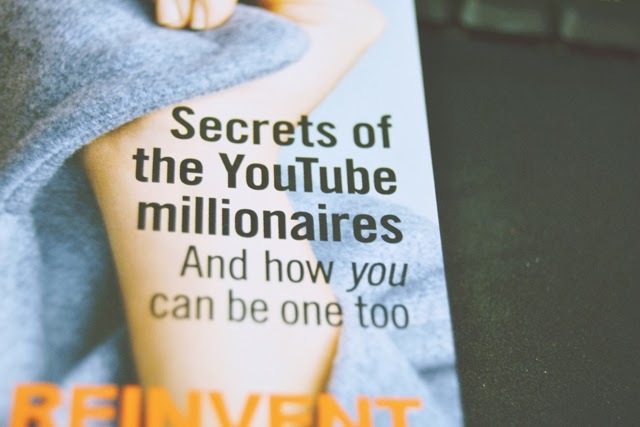 First of all, let's take a closer look at that headline: "Secrets of the YouTube millionaires and how you can be one too". Earning a million pounds from my videos? Yes, please! 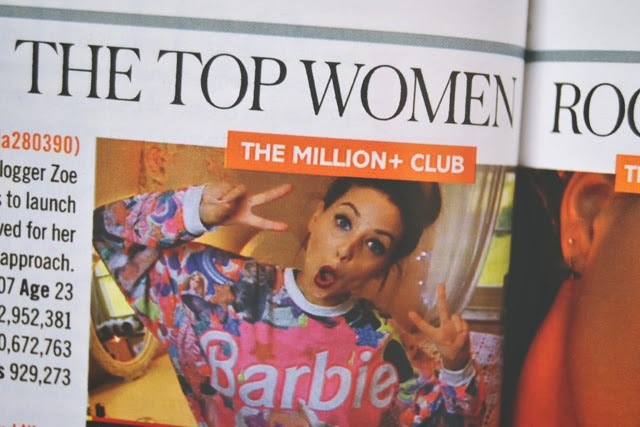 The article also lists YouTubers who are in "The Million+ Club", such as Zoella and Tanya Burr. Wow, I didn't know they earned over a million! Oh, wait. The reference to millions is in terms of subscribers, not pounds. Slightly misleading. I wouldn't be impressed if I was one of the YouTubers who are implied to earn over a million. Now let's read the article in a little more detail and pick out some key quotes. It's a career game-changer: once they've grabbed the attention of their audience, they are commanding advertising revenue, sponsorship deals, TV guest appearances and opportunities to develop their own product ranges. It's that simple, kids! Except it's not. How many vloggers are there out there with tens and thousands of subscribers, who have certainly "grabbed the attention of their audience" but are still working full time? Lots. Because it's not that easy! I know I'm new to YouTube but let's for the moment take blogging as a very similar industry. I've been blogging for over 2 years now. I work on it around 25 hours a week. I earn advertising and sponsorship money, sure, but in 20 months, I've yet to earn a total of four figures. That's the reality. Not only is it anything but a career-changer, it's not even enough to live on. 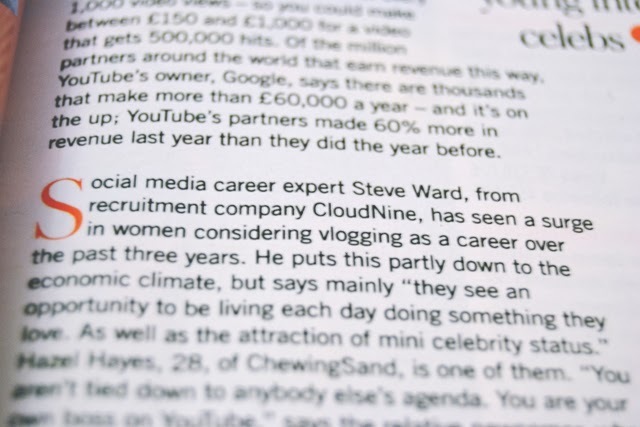 Social media expert Steve Ward, from recruitment company CloudNine, has seen a surge in women considering vlogging as a career over the past three years. What? It doesn't work like that! If you have dreams to be a full-time YouTuber, then awesome! By all means work towards that. But who on Earth is going to a recruitment agency and saying "Have you got any vlogging roles?" For most people, it's just not a viable career option and certainly not one you should rely on. It's like going into a recruitment agency and saying "I'm considering being a Hollywood actress as a career". You might be able to make some money from a less glamorous form, but only a select few will make that elite. 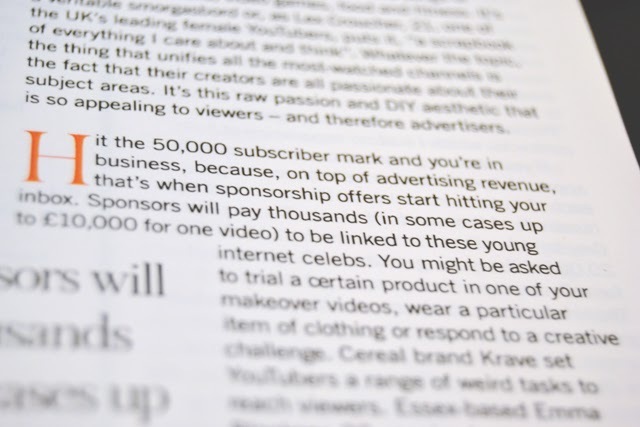 Hit the 50,000 subscriber mark and you're in business because, on top of advertising revenue, that's when sponsorship offers start hitting your inbox. Sponsors will pay thousands (in some cases up to £10,000 for one video). So much wrong with this, I don't know where to start! A) The assumption here is that if you reach 50k subscribers, that's it. Put your feet up, you're set for life! B) Sponsorships often start waaay before that mark anyway. C) Sponsorships are not going to be thousands unless you are one of those biggies (ie: Not 50k). 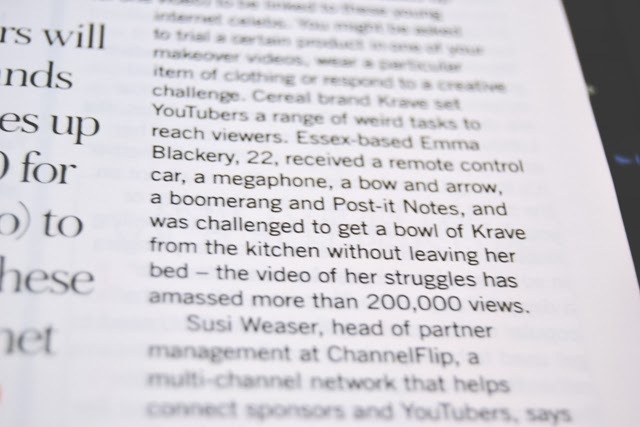 Cereal brand Krave set YouTubers a range of weird tasks to reach viewers... [A YouTuber] received a remote control car, a megaphone, a bow and arrow, a boomerang and Post-it Notes, and was challenged to get a bowl of Krave from the kitchen without leaving her bed- the video of her struggles has amassed more than 200,000 views. "Wow! Get me on YouTube! I want to strap a bowl of cereal to a remote control car!" Seriously, what? For one thing, this is not news: There are always totally irrelevant companies (Krave, really?) trying to get bloggers and YouTubers to join in with "zany" challenges for a bit of (usually free) advertising. More to the point though, what was in it for her? Did she get paid? Why are you telling us this? The opportunity to whizz a bowl of crunchy chocolate-filled cereal around the house is not exactly in my career plan. 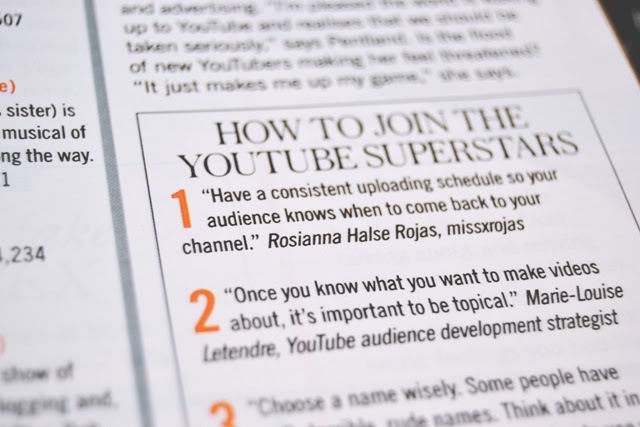 The article then gives 5 tips on "how to join the YouTube superstars". Common sense stuff, really: Choose a good name, don't give out too much personal information. Good advice for all YouTubers but not exactly a 5-point plan to instant success. If only I could become a YouTube superstar by not revealing my surname! Oh gosh I love this post! Yes the amount of people that are now creating blogs and vlogs with an aim to monetise everything - it's plain as day to see right through this! I am immediately put off if I think someone is reviewing something with this kind of purpose - sure there's nothing wrong with it if they legitimately like the product in the first place, but it's hard for people to see beyond an advertisement. I created a blog purely about culture opinions, one that has recieved hardly any buzz around it but I appreciate every comment I get and still write it regardless. It's only today that I decided I wanted to create more of a fashion and beauty one (I just tweeted you with my Gatsby post). This decision to venture into fashion and beauty wasn't for the aim to make a career out of it, in fact these kind of opinions on this genre of blog had put me off in the first place. I blog because I love to receive feedback and share my opinions, not money! I am in the same mindset of you, I'm sure these bloggers are very humble and would be embarrassed by this misleading millions title. I am merely against the promotion of blogs purely to make money, and the people that follow this desire. I think it's important that you let blogs and the like evolve naturally, rather than trying to force it. I love this post also! And you're right the blogging novice, everyone is doing it for the money! 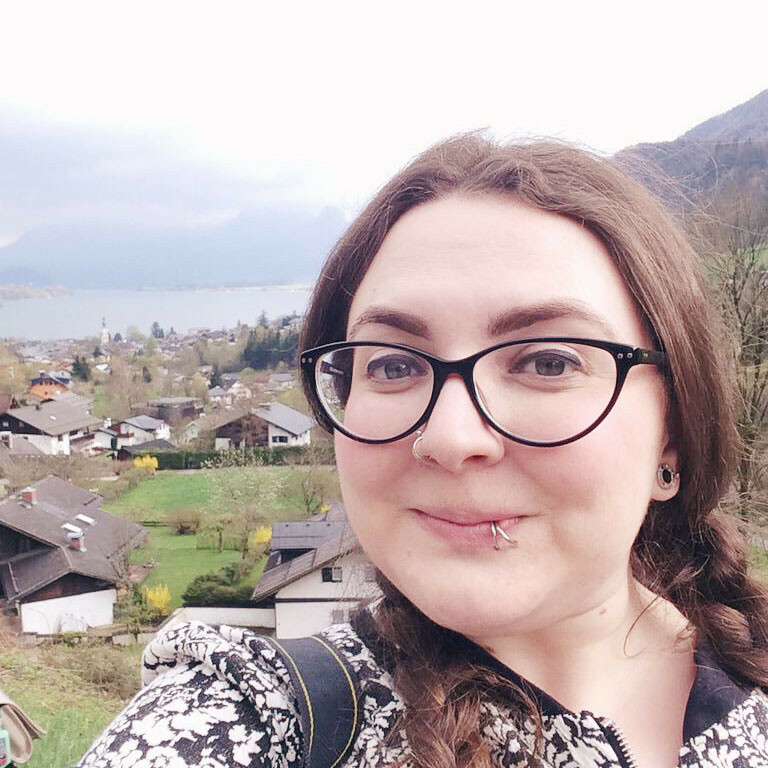 I've only just started blogging and it purely to share my experiences and tips for other people to learn from, which are the types of blogs which have always inspired me. It's so important to have a real motive behind your blog. Saying that, I'm not at all opposed to people making money from them. My issue was the way Glamour presented it as an easy way to make money. God magazine articles like this do my absolute head in!! So misleading both for the youtubers themselves and also for those who are thinking of starting a youtube channel. That's what annoyed me so much- They make it sound so easy! Articles like this are ridiculous and make people think that it's super easy to make a career out of this, when it takes a lot of flipping hard work! Articles like these make me RAGE. haha! It is so much hard work and they just skipped over that completely! Brilliantly written, as usual! Really winds me up when magazines write stuff like this, I (and I'm sure a lot of bloggers and youtubers) put a ton of work and care into my blog and channel yet I've never earned a penny off of it, because I don't do it for the money or popularity, I do it because it's a hobby I enjoy and want to develop! It's insulting to those bloggers/YouTubers who have built up a career too as it totally ignores the work they've put in. Just because they happen to be making money from it doesn't mean that it will happen like that for everyone. And anyway it simply can't last forever, can it? I don't get why people start blogs and Youtube channels as if it can be classed as a career choice. Like come on, what a way to look at life! "I want to be a famous youtuber" - it doesn't exactly strike as ambitious. Or maybe it's TOO ambitious! You're right- It's such a short-lived career! Now I know not to buy it! I considered it but it doesn't look anything too special! Yeah, I wouldn't recommend it haha! Love this post, the article makes it sound so easy...HA! Exactly! I think it's so insulting to those people who have worked for years to build up their success! I totally agree with everything you've said. What worries me is that it implies that all you have to do is upload videos, get subscribers and BAM! You'll be bringing in money. But it doesn't work like that. Like you, I have a full-time job and I work on my blog for around 20-30 hours a week (depending on my plans). Yet I don't bring in even four figures, I could never give up work and live on my blog and I know there are plenty of YouTuber's that have a great following but aren't earning a huge amount of money. I do hope that young people aren't reading this and thinking it's "easy" money and giving up on looking for other careers. It's such a dangerous implication. It makes it sound like a viable career choice when there's actually very few people who will reach that level of success. Love it, am off to start my youtube fortune now... I might have 50p in a few years time! I remember her tweet to you! I'm so glad you decided to post about it! I recently attended the New Media Expo and they kind of went against everything they say in the article. If you want to make it big, you have to work hard! The article also makes it sound like the famous ones only upload for the money! If you're joining YouTube just to make it big and make money; you're doing it wrong. You should make videos with the hope of connecting to people and making a difference or impact! Exactly! The most important thing is to work hard! I find the vlogging world insane nowadays. I was a massive fan of youtubers back in the day when it was considered extremely geeky - I'm talking about watching the likes of Charlie McDonnell and Alex Day religiously. I'm still coming to terms with the fact Charlie isn't the most subbed to youtuber any more and the whole 'type' of person who does youtube videos has just seemed to change hugely. I don't think even the Suggs or Tanya Burr can take this for granted as a career now though. I mean, if the big youtubers of just a couple of years ago are already has beens then who's to say how long this burst of success will last? Exactly! Even those huge YouTubers should have back up plans. They won't last forever! I wonder what Tanya Burr and Zoe make of the article as to begin with it does sound like Glamour are implying rhat they are millionaires in the money sense. They should've got them to write the article, or a response piece on how much hard work it really is to become a youtube success. If I were them, I'd be complaining! Brilliant article Becky you're completely right, it's so misleading, being internet famous is like being rich on monopoly, it's not real so why's it important? Being famous for the sake of being famous is such a transient and empty endeavour it's frustrating that Glamour's promoting it as a viable lifestyle choice. I don't know so much. Fame is fame, regardless of how it's achieved. I don't think there's anything wrong with a desire to become famous and I don't know if anyone on YouTube is trying to achieve fame for fame's sake. I think most just started as a fun hobby and it exploded for them. The best advice I heard about getting successful on Youtube was from Hank Green at LeakyCon, who basically just said "Well...step one is start in 2007..." - his point obviously being it damn near impossible to be get anywhere near where some of these successful Youtubers are. You can't repeat their journey and you shouldn't try to replicate it. I think magazines really skew the ideas around blogging/vlogging and getting successful on theses platforms. Not to mention the fact that most of these Youtubers have other means of financing their Youtube career before or whilst they're making videos (Rosianna who's mentioned in the article for example is a full time PA). Yes, it's possible to get big, but you really have to work at it and articles like this are just so misleading. Plus first and foremost shouldn't the first step into Youtube be because you love making videos? Was there anything in the article about that? Haha that is so true! The moment has passed! Nope, nothing about enjoyment in the article, believe it or not! To be fair, if I was paid £10k, I'd probably promote cat litter! Great post Becky, totally agree with you. Seriously, who the hell writes these things?